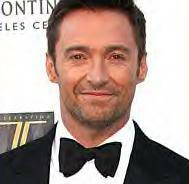 Hard to believe but Hugh Jackman has not worked on a film in over a year. His next role will be in the film Real Steel which starts shooting soon. The IMDb describes the film as: "A future-set story where robot boxing is a popular sport and centered on a struggling promoter (Jackman) who thinks he's found a champion in a discarded robot. During his hopeful rise to the top, he also discovers he has an 11-year-old son who wants to know his father." I am definitely looking forward to this movie! BTW, doesn't Hugh look fantastic in a tux? These pics were taken on Saturday when he attended the Fifth Annual A Fine Romance benefit gala at 20th Century Fox in California. More pics here. Vinnie Jones: One of Hollywood's hottest gay pin-ups? PHOTO: It's official. Bullock's entire life has jumped the shark! What would you do if you were this close to Alexander Skarsgard?